The traditional Sunny Gold almost succeeded in persuading Gavaskar to come out of retirement! This SG bat has unique contoured edges and is extra thick around the sweet spot. We take pleasure to introduce ourselves as one of the renowned firms for providing the best-in-class range of SG Cricket Bat. Traditionally shaped, Thick edges, curved blade, for powerful performance. Weight : 1180-1250 | Grains : 5-7 Grains. - Exclusively hand selected & nurtured. - Choice of long handle/short handle/long blade. 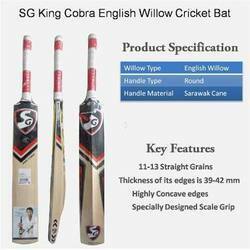 We are specialized in offering SG Cricket Bat. We are amongst the most reputed names in the industry, offering SG Cricket Bat.